The faculty of Tourism and Hotel Management organized a field trip to Bibliotheca Alexandrina on Tuesday 12/12/2017. This was held under the supervision of the faculty Student Activities club. 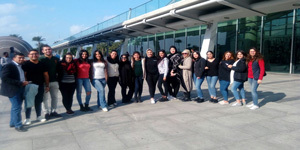 More than 35 students, from different academic years, were taken in a guided tour around the Library where they got acquainted with the history of the Library, its departments and the in- campus museums and exhibitions like Antiquities Museum, Sadat Museum, Manuscript Museum and the World of Shadi Abdel Salam Exhibition.